2014 was a rough year. We went months without any real updates, and then in the last four months there were Panda, Penguin, Pirate, and Pigeon along with tweaks and refinements along the way. In fact Penguin was never given an end date; it just keeps on rolling like Tina Turner on a river. So now we are a few weeks into 2015 and the year started off with a bang of bad info and discussions around them. First, Moz let their White Board Friday be taken over by a malcontent with nothing but unfounded negatives about our industry and the good people in it selling his secret undisclosed sauce. Then the U.K. Apprentice gave the £250,000 prize to a guy who is going to sell SEO services seemingly without regard to quality at a price that would make a scam SEO cry. So let’s reset and get started on the right foot. The industry is running on some bad myths right now and though most have been said, they bear repeating. Now for those of us who understand SEO, we know this is not true. We can do the same thing over and over again, albeit customised for client needs and get the results we expect. This is because search is based on an algorithm. Algorithms are maths. Maths means you can test against it and see what works and what doesn’t. If SEO were Voodoo or Bovine Faeces this would not be possible as all we would be doing is guessing and we could never replicate our results. However, we do. We do it for clients every day. But my site did not perform when I hired an SEO, why? While I cannot speak to your personal experience, it is likely to fall under the category of someone scammed you and you didn’t know how to suss out your practitioner or you did not do your due diligence. So just a few notes on how to do this. While not perfect check points, these can help. First, those scammers usually swim alone. They won’t know many other SEOs of reputation on LinkedIn, Twitter, or Facebook. They are not sought out to speak or write. You will not see them interacting with other SEOs in the public space. The SEO community is very small. It is largely self-regulating and bad ones are not given access to a lot of private information or networks. Take your time, do your due diligence, check their recommendations on LinkedIn, Google to see if they speak or write, find out if other SEOS have recommended them – it is not surefire, but it is helpful. Of course some of this is harder with newer SEOs, but still they should be part of the community. We lean on each other quite frequently, as no one can know everything. Even if they are legitimate, if they are not connected to other SEOs, chances are they cannot provide you a best service – there is just too much to know as a lone wolf. The only reason someone like Mark E Wright of the U.K. Apprentice was able to convince an investor such as Lord Sugar (the U.K.’s Donald Trump) that a £400-a-month service would be a money maker and just needed a personal touch is because the perception of what SEO services are and what they mean. When you hire an SEO, you are not just hiring someone who is going to change a few titles tags, throw up some links, and tweet a bit. Maybe three or four years ago you could get away with that strategy, but today it is the short road to sadness and tears and an empty bank account. You CANNOT buy good services cheap. Why? Because this is an ever-changing industry that requires its practitioners to keep up on a daily (DAILY, no exaggeration) basis on all the changes to algorithms and tools and just what is the next thing in website visibility. This means we are constantly reading, testing, asking, and working. We don’t complain; we love what we do. Most of us enjoy the puzzle and the pace. However, this means you are hiring a knowledge base NOT just a service. There is no one that does this work for cheap that is giving you the service you need. Now, it might be affordable. They might be able to work with your budget, but if someone is offering you a few hundred dollar a month plan – run! I don’t care if they did win the U.K. Apprentice. Part of the controversy of a Moz White Board Friday was played out on Sugar Rae’s blog when the author not only called everyone who was doing what Google suggested to do “Snake Oil Salesmen,” but also claimed to do 300 audits a year. Well, it is possible if all you did was run a few tools and wrote a few paragraphs around those results that you could give it to a client and say you did an audit. But from this auditor’s perspective, you didn’t. Tools are often wrong. There is always something you find in eyes on audits that was not apparent to the tools run. Not to mention just the analysis plus write-up on even a small site can take a day or more to put together. No one is doing good work for little money or in a day or even two and if you do a full link crawl, you won’t even get started on the write-up for days or maybe weeks depending on how many they have acquired. Why does this matter? It matters because a bad audit can hurt your site more than doing nothing at all. It can actually cause you issues you did not have before or if not properly analyzed give you bad data that you then act on. Audits need to be done by someone who understands the many points on the algorithms as well as someone who knows the ins and outs of penalty signatures and penalty recovery. NO ONE who knows these things gives this information away for free or cheap and not in a day. Again, can it be done affordably? Sure, but not cheap and never free, unless included with additional services. So make sure you DO NOT cheap on your audit. This is a sure pathway for more tears and potentially a penalty. You are again paying for a knowledge base. In fact, a more specialized knowledge base than your regular SEO service provider. Make sure you invest in it properly and then make sure you do one a year at least, so you know if you have a potential issue. Sadness is not doing an audit and finding out via a Google algorithm or penalty. If you are launching a new site or have one that has been sitting there just generating content with no link plan, stop now. A site still needs links to compete. This means you need links to your content. You need that vote that shows people like you and care about your site. Google still counts this rather highly. Unfortunately, there is this myth today that all link-building is bad – it isn’t. Link buying is bad, unless you are aware of the potential to burn your site and want to take that risk. However, link-building, which means proper link acquisition, is vital to a well-positioned and highly trafficked site. But isn’t content king? All the content in the world will not get you the visits and positioning a well-placed set of links will get you. Now, this does not mean you should not concentrate on your content marketing – by no means should you stop generating great content. However, if you think you can just build it and they will come, you will be sadly disappointed and unless you have very deep coffers you will run out of money waiting. Of course there is an exception to every rule, such as big brands, but as it generally goes, you must build proper links to your site. Of course, as the other myths go, this is not cheap. If it is cheap – run! Good link acquisition costs money. It can take hours to find and promote a good link to your site. Just one. Imagine a full link-building plan? When it comes to link-building, cheap links will be bought links and getting that past Google these days takes great expertise, so in actuality properly bought links are not much cheaper than acquired ones. They are just used for different reasons. Note I say position, because with personalisation and geo-location, there is no true rank, but that does not mean it is not important. If you are hand-checking the main traffic terms for a site and see that it is on page two, how much traffic do you think it will bring? While if in #11 or #12 more than #9 or #10, but once you get to #13 you are going to fall off the graph. So while you cannot be sure that for every person your site is going to show in number three, you can be relatively sure that it will be near that position. However, if you are not trying to garner top position it won’t be there. You should know what your site is positioning at for at least your top 10 traffic generators, so you know if a slip occurs and how that slip is affecting your traffic. You will never know exactly where it is for every visitor, but you will know if your traffic slip is due to a site position loss. BONUS MYTH! SEO Is Dead! This is the most overused bit of click bait typically written by people not in the SEO industry at all. SEO is dead. Stop using SEO. Well, you can if you want to lose the search game. Organic search is still the number one way people get to your site, even on mobile, as shown by a new study by the IAB. So, no, SEO is not dead. In fact, SEO will never be dead as long as there are algorithms in search to position a site against. So if someone tells you to not worry about SEO, know this means to lose out on a significant portion of your website visibility and traffic. It is as vital as it was one, two, and even five years ago. It is just handled more broadly and contains far more factors, but that is what you pay us to know. And since we know SEO is not dead, stop thinking of your SEO as an add-on service. Ten years ago if you had a brick-and-mortar business you would be paying for yellow pages, radio, newspaper, and billboards. You would know you have to do this and you might reach a few hundred thousand people if you lived in a big city. Today you have the capacity to reach millions, but you have to invest in your site’s website visibility (SEO). The world is your oyster, but you need to treat your SEO budget as a necessity not a maybe if. 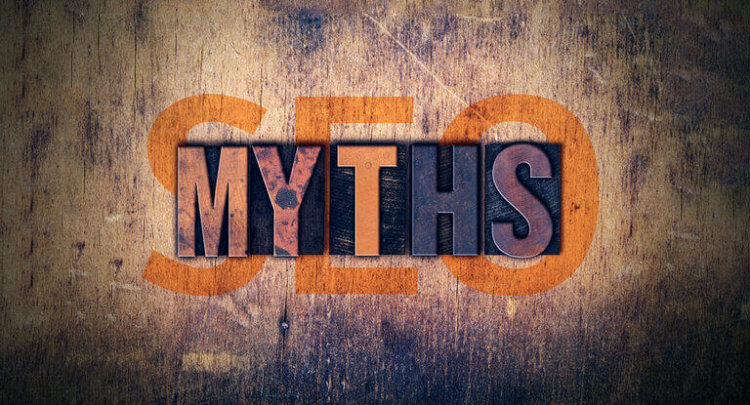 OK so let’s see if we can get past these myths, start out 2015 with a new plan, and if we get to December without a single “SEO Is Dead article, I will buy a round at the next search conference. « Are Keywords Relevant to SEO in 2015?